Dave: Country and western music is about loss. Soul music is also about loss. But the difference is in country and western music they've lost, they've given up, they're just at home whining about it. In soul music they're struggling to get it back and they haven't given up. Every note that passes through your lips should have the tone of a woman who's grasping and fighting and desperate to retrieve what's been taken from her. How refreshing to see a movie starring aboriginal girls, who aren't portrayed as drunken, drug taking hopeless cases. I'm not denigrating those films—some are world-class—but its wonderful to skip out of a movie that shines with positivity telling a unique aboriginal story. 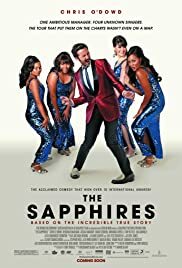 The four girls who play The Sapphires are real gems (excuse the pun). Deborah Mailman as the tough-nosed big sister is a true talent and, of course, Jessica Mauboy fans will enjoy her fabulous voice and she can really act too. All the minor actors are a treat. Chris O'Dowd, most famous for his recent hit "Bridesmaids" has chemistry but he seems to portray the same character in every film. Time for him to move on to a psychopath before he is typecast. Please go see this and support quality Australian cinema. This one is very deserved of your dollar.